When you have a meal, your digestive system breaks down food to provide your body with essential nutrients. Food from your mouth passes through the esophagus into your stomach, which is protected by the esophageal sphincter that helps keep food from backing up into the esophagus. Your stomach mixes food with digestive juices and then passes it into the small intestine. A number of factors influence the processes that take place within the stomach, where you can develop sensitivity. Indigestion is a common problem that can occur if you have a sensitive stomach. Its symptoms may occur only when you eat certain foods, or you might have a problem on a regular, continual basis every time you eat. Symptoms vary, but they can include bloating, burning and pain. Indigestion often occurs simultaneously with heartburn, which is a burning sensation in your throat or upper chest. A sensitive stomach, sometimes called functional dyspepsia, can cause symptoms ranging from feeling full very quickly to stomach discomfort, belching, bloating or nausea. This may be caused by a number of abnormalities that create sensitivity when certain foods enter the stomach. Eating more frequent, smaller meals and avoiding food with high-fat content often relieves the symptoms, although some people with dyspepsia also have psychological issues that also contribute to a sensitive stomach. Occasional, mild indigestion is usually not harmful, but it can lead to serious complications that include unintentional weight loss, jaundice, vomiting or severe pain. Avoiding certain foods may help, and these often include greasy or spicy food, alcohol, chocolate or carbonated beverages. Other complications that can affect stomach digestive processes, regardless of what you eat, include nervousness, emotional turmoil or smoking. A sensitive stomach that is not alleviated with a change in diet could be due to another disorder, such as an ulcer. In addition to eating smaller meals more frequently, chewing your food thoroughly can help to relieve sensitive stomach symptoms. Relaxing prior to eating also can help to allow stomach muscles to function properly and relieve the problem. Maintaining a healthy weight can help, because additional weight places undue pressure on the stomach. making it more difficult to digest your food thoroughly. Talk to your doctor if your stomach is sensitive, to determine the best course of action for you. Once a certain food has caused stomach discomfort, you should avoid that food to prevent further complications. 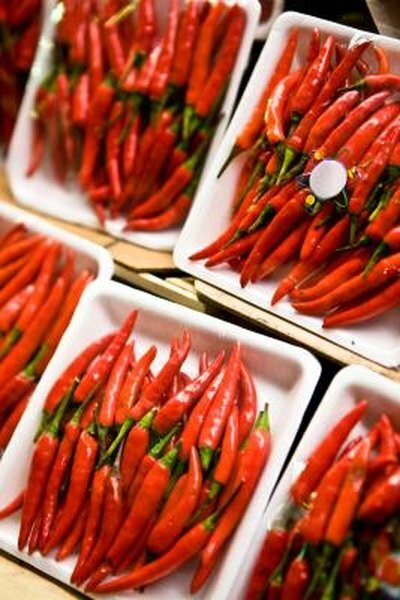 Foods most commonly associated with stomach indigestion and painful stomach symptoms include chilies, hot pepper and black pepper. Food with a tomato base, citrus fruit and many kinds of juices also tend to upset sensitive stomachs.